A big philanthropic gift can make a huge difference, especially when the timing is right. That was the case when James and Frances McGlothlin announced in 2005 that they would give $30 million and their American art collection to the Virginia Museum of Fine Arts in Richmond. Jim McGlothlin is chairman, CEO and the now-sole owner of The United Co., a 44-year-old Bristol company that sold its coal mine holdings for an estimated $1 billion in 2009 to the Ukrainian firm Metinvest. The company’s businesses interests — which over the years have included coal, steel, oil and natural gas, a cogeneration plant, roofing materials and pharmaceuticals — now are focused on financial services and golf courses. Alex Nyerges, the museum’s executive director, says the McGlothlins’ gift — valued at more than $100 million nine years ago — was “absolutely essential” to the success of the museum’s campaign to build a $150 million addition. “The timing of it was absolutely perfect,” Nyerges says, explaining that the fundraising effort had lost momentum after an initial flurry of gifts. The 165,000-square-foot addition, named the James W. and Frances G. McGlothlin Wing, was completed in 2010. It has transformed the museum, making it one of the most popular destinations in the Richmond area. Meanwhile, the value of the art the museum will receive from the McGlothlins has soared. They have continued to add to the collection, which now numbers about 150 pieces. Nyerges says a conservative estimate of their total value is more than $250 million. The McGlothlins’ philanthropy has made many dreams come true. 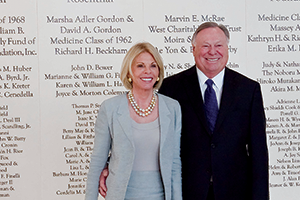 In addition to the VMFA gift, they gave $25 million to the Virginia Commonwealth University School of Medicine to help fund a $158 million medical education building. They also raised $15.3 million for Mountain Mission School in 2010 by sponsoring a charity golf tournament featuring golf legends Gary Player, Arnold Palmer and Jack Nicklaus. The school, based in Grundy, serves children (including some from foreign countries) whose parents are unable to care for them. Not all of the McGlothlins’ causes, however, are high profile. A partial list of their projects in Southwest Virginia includes a soup kitchen serving meals five days a week and a program providing coats to needy school children. They also help Mountain Mission graduates attend college without having to go into debt. Their philanthropy also extends to a number of programs in other states. While they make many donations directly, some of their gifts are made through their family foundation, the company and the United Company Charitable Foundation, which also involves former business partner Nicholas Street and his wife, Fay. The $25 million gift to VCU was the result of a relationship with the school that began when the McGlothlins underwent treatments to relieve chronic pain. The 12-story, 200,000-square-foot medical education center opened last year. At Jim McGlothlin’s alma mater, the College of William & Mary, the couple created the James W. and Frances G. McGlothlin Leadership Forum in 2011, bringing industry leaders to the campus to discuss pressing issues with students and faculty. Jim McGlothlin’s philanthropy at W&M attracted national attention in 2007. Many news sources reported that he “revoked” a $12 million gift to protest then-President Gene Nichol’s decision to remove a cross from daily display in W&M’s historic Wren Chapel, which is used for a variety of college functions. McGlothlin says those reports were incorrect. Jim McGlothlin serves on the boards of the VMFA, Mountain Mission School and the PGA Tour. 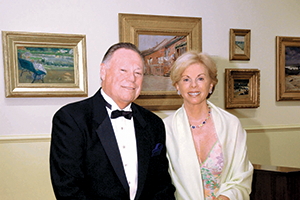 Fran McGlothlin is a former trustee at the art museum. The McGlothins support all of their charitable causes, large or small, with the same passion. “There is so much need, and we can all give in some way, whether it’s our time or material gifts,” Jim McGlothlin says. Virginia Business: How did you become involved with the [Virginia Museum of Fine Arts] as philanthropists? Frances McGlothlin: We’ve been art collectors for over 20 years. The way we got involved initially is I was given a tour of the museum while Jim was in the hospital [in the late 1990s]. I really didn’t know that much about the VMFA because we weren’t living in Richmond. I was pretty taken with the museum and what I thought could be done to help the museum … After learning about the VMFA, I became a trustee, and Jim is a trustee now … We collect American art, and that’s an area at the VMFA where we thought we could be helpful. It occurred to us that we could help them now, with the new wing, and then also help them later at our deaths as we’re leaving our entire collection to the museum. VB: What inspired you to begin this collection? Frances McGlothlin: I had always had a great interest in art. That had not been something that had interested Jim, but it seemed to me that it was something we could do together well into old age. He’s an avid golfer. I do not golf. I took him to his first auction. That was right before we were married [in 1997], and he bought his first painting, which was a gift to me. He has been pretty much hooked ever since. At first, it was just sort of the art of the deal. But he has developed quite an eye. It’s a great thing to do together. VB: Was it hard to think about the collection going to someone else? Someone mentioned that having art is sort of like having children. It’s kind of hard to think of them letting go. James McGlothlin: We’ve been at this long enough where we know most of the top collectors in the United States. They struggle with the very thing you’re talking about. Fran and I sat down and talked about what would happen to our collection at our deaths. We could give it to our children, but we thought the best thing to do is to give the collection to the whole community so everyone can enjoy it. When we thought about it, hands down the Virginia Museum is where the collection needed to go. We feel really good about that. And the kids do, too, by the way. VB: Is there any one particular American artist that you’re a big fan of? James McGlothlin: We both think John Singer Sargent is the best American painter. We have over 15 of his paintings. They’re some of the most valuable. Then I think George Bellows is second in our collection. But we have a very wide range of American painters and particularly in the early Impressionist era. VB: I wanted to talk a little bit about the donation to the VCU … the $25 million contribution for the medical [education] building. Now my understanding, that came about because of some medical treatments that you both had at VCU. Is that correct? Frances McGlothlin: Yes. That’s how we became interested in VCU to begin with, because Jim had back surgery and I had neck surgery. We got to know a neurosurgeon there named Harry Young. He is an amazing doctor. Through him, we learned about the needs of the hospital and the institution. And that’s how we got involved. VB: My understanding is Mr. McGlothlin’s stay at the hospital also coincided with you all becoming acquainted with [Sydney and Frances Lewis, the founders of Best Products who were major donors to the VMFA]. Is that correct? Frances McGlothlin: Yes … I was walking down the hallway looking at a frame that a dealer had sent me from New York for a picture that we’d just purchased. I met Frances Lewis whose husband, Sydney, was at the other end of the hallway. And she said, “Hi, I’m Frances Lewis. What are you doing?” And we started talking, and the next thing I knew, she had me over at the museum. VB: So, how did you happen to make the $25 million gift to [VCU]? James McGlothlin: There is a good story about this. I got a call from Dr. Harry Young who wanted to talk with Fran and me along with Jerome Strauss, the dean of the medical school. We were in Williamsburg and invited them down to dinner the next night. Both of them looked a little stunned. And Harry picked up quite a bit. VB: I wanted to talk a little bit about some of your lesser-known charitable operations. Could you both tell me a little bit about your interest in the Mountain Mission School in Grundy? James McGlothlin: Mountain Mission is a great institution that has anywhere from 250 to 300 children that live there full time and go to school there on campus … They aren’t necessarily homeless, but parents are physically, mentally, financially or for some other reason unable to take care of them. Sometimes they come right at birth. They will always have five or six babies. Frances McGlothlin: We generally have 40 to 65 kids in college. We also give them an allowance every month … The rule is, if you can get into college, you get the scholarships that you can get on your own, and then we pay the difference so that you can come out of college debt free. 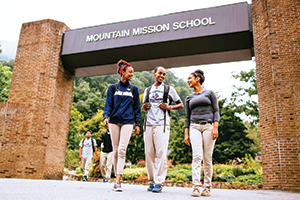 James McGlothlin: The United Company Foundation has a career counselor on [the Mountain Mission] campus that works full time for us, helping students with SATs, helping with extra studies … those kinds of things. The career counselor also takes them to see colleges. Frances McGlothlin: The other thing is that we try to help students in finding an internship or a first job. We have a personal friend who just retired as the chairman of a large company. He has taken some of these kids under his wing and helped them to get summer jobs. If the children do well in the summer, they will be interviewed for permanent jobs after graduation. Already one has worked her way up in the corporate structure and is doing well. VB: Now I also understand that there are other charities that you support [in Southwest Virginia]. I saw mention of a soup kitchen in Bristol … and some sort of clothing program for needy folks. James McGlothlin: In 1997, we started a soup kitchen, and now there are two vans that deliver about 1,000 to 1,100 lunches a day, five days a week. We take it out in the community and deliver it to whoever needs this … Church volunteers come in and help us to prepare it and put it in the containers … We have several full-time employees [including professional drivers, cooks and a program director]. One of the things we really want to do is help other communities do this, too. Frances McGlothlin: We’ve offered to underwrite the vans and equipment and train them. We’re working on that now, because I think there are a lot of communities that could really use this help. VB: And the clothing charity? Frances McGlothlin: Someone who worked for us, whose wife taught in the public schools, mentioned to us that some of the kids came to school in the middle of January with just T-shirts and flip-flops. We started looking into this and decided we would let the teachers tell us who needed shoes and coats, and then we would let them go shopping and pick out exactly what they wanted. A lot of them had never been to a shopping mall. We started that program last year [in Bristol, Grundy and Buchanan County]. VB: Are there any other of those kinds of local charities that you all want to mention? James McGlothlin: We are very pleased with one that Fran has gotten involved in heavily in the last two or three years, Morrison School, which is a school for children with special needs. It has really struggled to be financially solvent. We managed to both give and raise money there, which is going to allow them to succeed. Frances McGlothlin: The two foundations and the company are building them a new school … The problem is that, in our area, there aren’t many special schools ... One of the reasons we became aware of this problem is that Jim and I have an autistic grandson. He lives in San Francisco where they have incredibly good facilities. In hearing what services were available there in California compared to what we have where we live, it just struck us as something that was really important to help with. VB: Now I wanted to ask you a little bit about your philosophy of philanthropy. Are there certain areas like health, or education, or some other area that you all are particularly concerned about? James McGlothlin: When we die, we’re giving our company and everything we have to our foundation. With that, we have to provide mandates and priorities to the people who are going to operate our foundation. We have provided a written policy on the mandates and priorities, and we plan to make a video soon which would allow the officers of the foundation to review these plans and refresh their thoughts about them in the future. The first priority is children. We want to feed, clothe, educate, shelter and take care of the health of children. Because if you don’t take care of the kids, we’re not going to have a future. The second is food and shelter for anyone who is in need. We live in a land of plenty, and yet there are people who go to bed hungry in our country. That’s where the idea of the soup kitchen comes in. The third is health, to help those whose health is in peril, to develop new, innovative and technological ways to improve one’s health. And fourth is the arts and sciences to contribute to the future cultural needs of our society in the arts and sciences. And lastly we provide funds for bricks and mortar. We think we need to assist in building the hard assets, which are required for supporting the above causes. We believe in Morrison School, and their mission. You’ve got to give them a place to work. And that’s true of the Medical College of Virginia, or the art museum, or various places that we help with funding for bricks and mortar. VB: Tell me a little bit about your involvement with William & Mary. For example, how did the McGlothlin Leadership Forum come about? James McGlothlin: I was invited to speak at the business school. I would teach this class called “Entrepreneurship.” Kids would come to this class, 50 or 60 or 70 of them, and I would take them through the history [of The United Co.], how we started a company and what we did, and let them ask questions. It would be two or three hours an afternoon for a couple of days or three days. One day I said, “You know, we really need some heavy hitters in here instead of me. We need to change this.” We thought up in the middle of the night the McGlothlin Leadership Forum … I went to see Dean Larry Pulley and Dean Dave Douglas, [of the business school and the law school], and I said, “Let’s find some guys to come and speak over a three-day period, and we’ll run this forum.” So we came up with the names, and they said, “How are we going to get them to do it?” So during lunch I called them, all three agreed, and that started the very first one. We’re going on the fourth year. VB: I’d like to ask a question about the Wren Chapel cross controversy … Do you think that you established something there for alumni and contributors to be more involved in the affairs of a school if they see something they don’t think is correct? James McGlothlin: I don’t think anybody ever told the real correct story about this. We had been asked to give a donation of $12 million to William & Mary. We were considering it, but we had never agreed to it. So when the president removed the cross from the chapel, we notified the school that we were no longer going to consider a gift. We didn’t take the gift back; we had never given it to start with. I do think we all need to take a bigger interest in our schools. Schools change, their attitudes change as well, and if we don’t take an interest, the schools may lose sight of their missions. VB: Anything that we haven’t covered that you all would like to talk about? James McGlothlin: We agreed to this article because we wanted to encourage everyone to engage in charitable giving. There is so much need and we can all give in some way, whether it’s our time or material gifts. There is no greater reward than seeing a small child’s eyes light up when they are given the gift of love and affection. We all have the ability to give this, the greatest gift of all.